Antwerp. The City of diamonds. For over five centuries, Antwerp has been the largest and most reliable diamond capitol in the world. Four large diamond exchanges are located here while 80% of all rough diamonds and 50% of all cut diamonds in the world pass through the city. The city of diamonds inspires. Here, experience meets creativity and knowledge meets passion. There wasn’t a better place to launch my dream of creating my own brand of high-end jewellery, back in 2015. GioMio Gioielli is driven by passion. I know, it is a word that is so often used in the world of jewellery, but here is why I think it fits GioMio in such a good way. As a young boy, growing up in Lebanon, I was fascinated by nature’s shapes, from leaves and flowers to branches. When I decided to come to Belgium and start a career in the jewellery industry, I already had the dream of creating my own brand. I’ve always been very keen to gain experience and while I worked as a goldsmith creating jewels for many brands, I started to put down ideas on paper in my spare time. After many years in Belgium, working, meeting my wife and starting a family, in 2015 the time felt right to create GioMio Gioielli. The passion that was building for several decades resulted in the first jewellery collections, putting the diamond in the spotlights, once again. And ever since, the love for jewellery has grown exponentially, resulting in an unlimited creativity. A mere four years later, GioMio has twenty different collections and has quietly revolutionised some aspects of 21st century jewellery. Working with 18 kt. Gold and diamonds is a privilege. The noble nature of these materials is inspiring, while the process of designing, shaping and polishing the gold has a magic-like feeling. In order to get to the most beautiful results, you need to feel the material and this is why I insist that each jewel we produce is handmade. 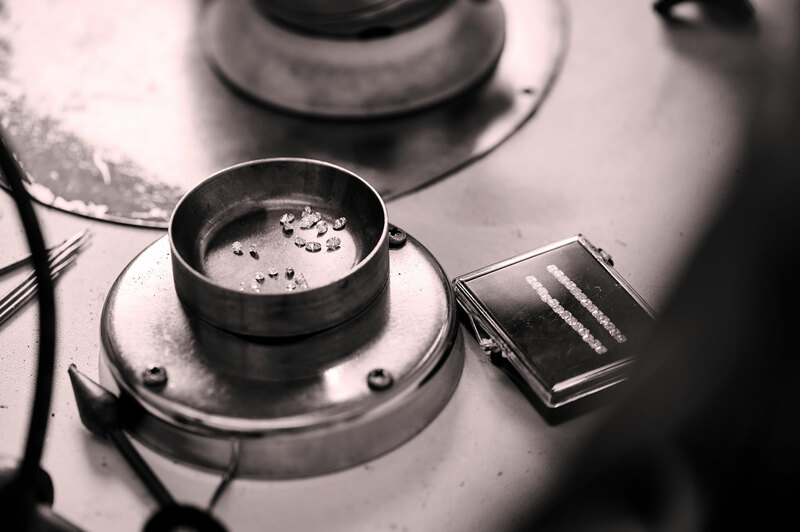 There are mechanical procedures that make it possible to produce jewels in a faster way than we do, but what we want to make jewels that shine like no other do. Our team takes all the time it needs to bring out the best in the diamonds and gold so that you can enjoy wearing the jewels to the most. The warmth of the colour, the delicate shapes of the designs and the hand-set precious diamonds make the GioMio jewels stand out. Every woman deserves to feel good about herself – this is why it was important for me to create so many collections as we did. No matter your age or style, we try to design jewellery that fits your personality. This results in a wide variety of rings, pendants, bracelets and earrings, ranging from discrete chic to exuberantly glamorous. Listening to women that love wearing jewellery, I learned about the wishes and needs they have. One of the most recurring comments regarded a limited flexibility and comfort of the jewels they wear. A tight-fitted ring or bracelet feels differently when worn on different times of the day. An in the morning comfortably feeling ring can feel very tight in the evening, the same way a bracelet worn in the summer can feel a little loose during the winter months. Making sure your ring or bracelet fits you no matter what, is not an easy feat to accomplish. At GioMio, we studied the possibilities and thanks to some creative thinking and technological innovation, we were able to develop a solution for both rings and bracelets. Gone are the days where ladies had to select the size of their jewellery by the moment they wanted to wear them. A jewel carrying diamonds brings a message of hidden tenderness. Wearing it reminds you of the special moment when it was given and will always bring you a warm feeling. When our creations reflect a women’s personality, the reason why we created it is rewarded. Noticing someone who wears one of our jewels fills us with tremendous pride and convinces us that relentlessly continuing to create new shapes and ideas is the right way to go. I truly hope that you enjoy wearing our jewels and invite you to discover our newest creations in this year’s publication. 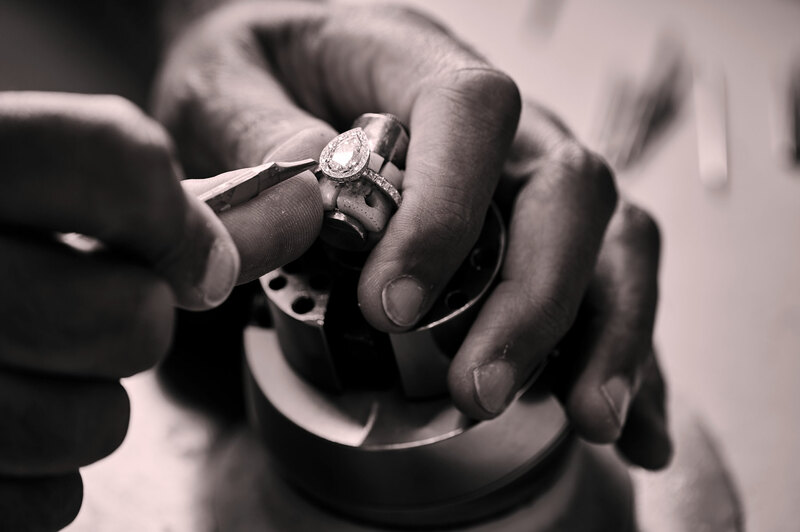 Creating GioMio was the result of being passionate and skilled as both a goldsmith and a designer. Both required hard work and constant training for Georges Sabbagh and his team in order to come to the point of creating a confident brand. Although modern day technology enables GioMio to work in an efficient way, designing and creating jewellery is mostly a craft done by hand. Like an artist carefully making his oils with pigments, a jewel designer selects the best materials such as gold and diamonds for his creations. In the GioMio atelier, the ideas become reality, beauty is paired with practicality and gems are set to perfection. And although the team is rather limited in numbers, the years of experience and craftsmanship are impressive. 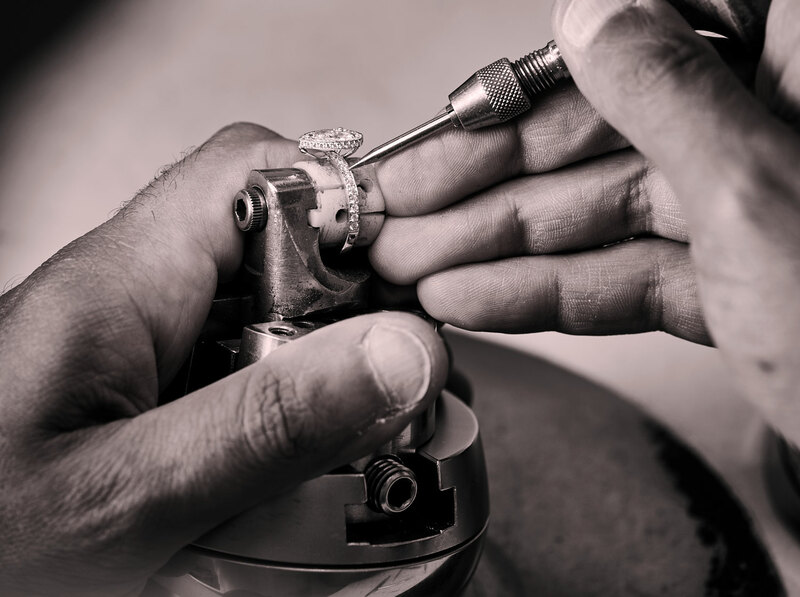 The same instruments that have been used by jewelers and goldsmiths for many generations are part of the GioMio atelier; working with fire to perfect the golden parts, with an eye for precision when setting diamonds.